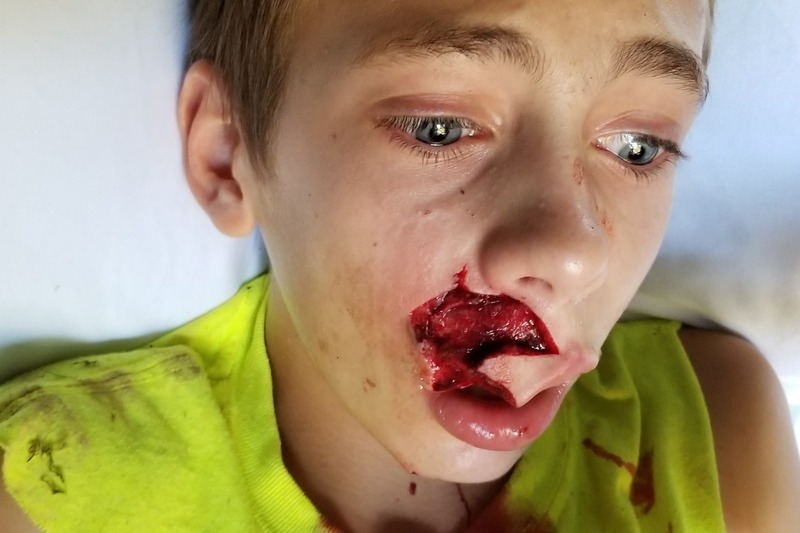 Dogs Bite Decatur Al: GEORGETOWN OH - A PIT BULL "SOMEHOW GOT OUT" AND MAULED A 12-YEAR-OLD BOY PLAYING AT HIS FRIEND'S HOUSE... 200 STITCHES ON HIS FACE! GEORGETOWN OH - A PIT BULL "SOMEHOW GOT OUT" AND MAULED A 12-YEAR-OLD BOY PLAYING AT HIS FRIEND'S HOUSE... 200 STITCHES ON HIS FACE! A 12-year-old boy is mauled by a PIT BULL and his mother says it could have been prevented. Cooper Benjamin, 12, of Georgetown was attacked so severely on Thursday, he was flown to Cincinnati Children's Hospital Medical Center by medical helicopter. The attack happened at his friend’s house on Green Acres Drive. Cooper tells FOX 19 NOW he was playing in the yard of his friend’s house when the pit bull climbed underneath the fence and jumped on him. “I was just saying to myself, 'Get this dog off you, anyway you can, do everything you can to get it off,'” Cooper said. Cooper now has 200 stitches on his face and wounds on his back and neck from the attack. His mother said it should have never happened. “The dog bit someone already," Benjamin said. "So the problem was there. The dog is still there. There's still kids running through the yard playing and my son just happened to be the one that got severely injured." Benjamin wants to know why the dog was still in her neighbor’s possession after the alleged first attack and why it wasn’t taken into custody of the Brown County Dog Warden the day her son was attacked. FOX 19 NOW reached out to the Brown County Dog Warden on Sunday afternoon but hasn’t heard back. The dog owner who does not want to be identified said she wished her dog was taken by the dog warden that night as well. She said the dog warden told her to quarantine her dog for 10 days until she could make the decision whether or not to put down her dog. The owner says she’s planning on putting her dog down, which is welcoming news for Cooper and his mother. “Yeah, I want to go down there and I want to be able to play with my friends and not be able to be attacked when I'm just trying to play with my friends," Cooper said . Cooper has another visit at Children’s Hospital soon and will see a plastic surgeon. "Benjamin wants to know why the dog was still in her neighbor’s possession after the alleged first attack and why it wasn’t taken into custody of the Brown County Dog Warden the day her son was attacked." Because you live in Ohio where the laws are designed to protect pit bulls over people.